Summer will soon be in full swing, which means grandmas, moms, aunts and others will likely have more time with the kids. And likely more time for kids to complain of being bored. That also means, though, that you have more opportunities to wow the wee ones and combat those unnerving "I'm bored" complaints. Here are a few ideas for preventing the boredom blues, featuring one of my favorite things: books. Try them out on your summer charges, let me know how it goes, and feel free to share in the comments any boredom busters you might have up your sleeve. 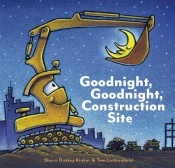 Book: Goodnight, Goodnight, Construction Site by Sherri Dusky Rinker. Cement Mixer, Excavator, Dump Truck and more all work oh-so hard during the day then tuck themselves in at night, resting up for the next day's work. Bubby loved this picture book featuring some of his all-time favorite trucks. Boredom buster: Take a trip to a nearby construction site to watch (from afar) the work vehicles doing their jobs. Younger kids may want to bring along their toy trucks of a similar sort; older kids may enjoy having a pair of binoculars on hand to get an up-close look at the action. Book: There's a Dragon in the Library by Dianne de Las Casas. This clever tale tells of Max and his visions of a dragon during story time at the library. Is there really a dragon in the library or is it just his imagination? And how can he convince Mom, the librarians and Officer Riley that there really is a dragon in the library. Boredom buster: Head to the library, of course, and seek out books about dragons, along with any others of interest to youngsters in tow. While there — or, better yet, before going — find out what activities are lined up at the library, where summer programs for kids are often a highlight of summer. They sure were for my girls when they were young. Book: Grandma's Bag of Tricks: Toad Cottages & Shooting Stars by Sharon Lovejoy. This book truly isn't just for grandma's as it comes in quite handy for anyone looking for activities for kids. With an older child, peruse the awesome options for fun, from restaurant night at home, to pinecone bird feeders, to fairy tea parties, tin-can bands and more. For little ones, pick and choose any of the many perfect for toddlers. Boredom buster: Not too hard to figure this one out as there are more than 130 activities to choose from. The hard part is making a choice. Consider having the child make a list of the ones you want to tackle together throughout the summer or a visit. Book: Meet Einstein by Mariela Kleiner. This book may be designated as for youngsters ages 2-4, but it's a safe bet that older kids will appreciate the straightforward introduction to one of the all-time great scientists. In addition to the story, the inside front and back covers include a pictorial rundown of all the tools needed for scientific exploration: goggles, beakers, nets for catching butterflies, gloves to "protect my fingers from sticky and icky things," and more. Boredom buster: The book outlines some of Einstein's great scientific discoveries related to light and gravity. Come up with a few experiments involving light — using flashlights, lightbulbs, fire, rainbows — and gravity — any manner of things that go up then come down (spills, jumping in the air) or go up but don't come down (balloons, kites). As the book notes, even preschoolers can grasp the concepts of light and gravity. "Help them make the connection in everything they see and do, and teach them that science is all around them." Good to know: Clicking on the book covers will provide more information on the books. They are NOT affiliate links, and I earn nothing by you clicking on them. And in the interest of full disclosure, I purchased the Toad Cottages and Construction Site books myself; the others were sent to me for free by the publishers, with no obligation to review or write about them and no compensation for doing so. Fill in the blank: When I get bored, I ___________________.